For many years, mercury has been used in a number of products, processes, and laboratory operations. Mercury is universally regarded as a hazardous material. Health and safety regulations require that anywhere mercury is used, a means of managing spillage and human exposure must be provided. 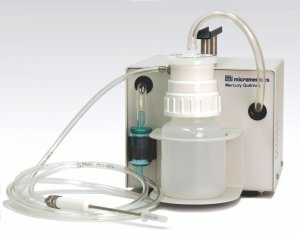 Micromeritics' Mercury QuikVac is an excellent low-cost method for quickly containing mercury spills. The device is designed to be specifically useful in collecting those elusive mercury droplets and small mercury-contaminated particulate matter. Its compact size and light weight make it ideal for laboratory applications. Mercury is collected in a 250-mL recovery vessel and a replaceable 0.3 - 0.5 micron activated carbon filter assures that the device exhausts clean, safe air.